As Cave Dweller Ricardo Marquez enthusiastically wrote about last night, right-hander Zack Greinke is now an Angel. 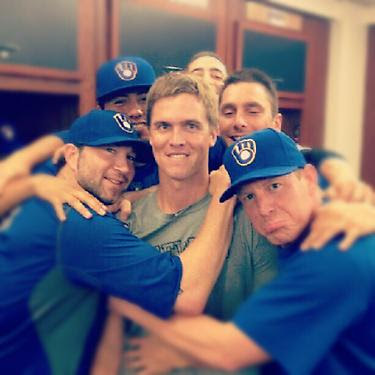 Before heading West, Greinke of course said goodbye to his former Brewers teammates. And, thanks to Milwaukee reliever John Axford, a glimpse into that moment was shared with the world. Axford, one of the most interesting MLB players to follow on social media, posted the following photo to his Instagram page shortly after the trade was announced. As a reminder, the MLB Fan Cave is now on Instagram as well. Be sure to give us a follow for exclusive photo content documenting happenings in the Cave.